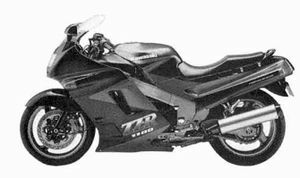 The Kawasaki ZX1100C was a supersport motorcycle produced by Kawasaki from 1990-1993 and more commonly known as the ZX-11 Ninja. 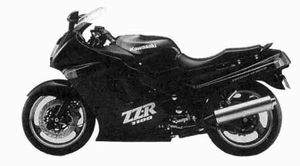 In 1990 Kawasaki introduced the ZX-11 Ninja /ZZR1100 (Europe). It shook the world. 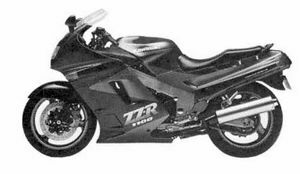 A bike that fast, that powerful! Who could control that kind of power? Well, as it turned out: a lot of us could and still can. Although not meant for a beginner the bike is kind of a gentle giant: the power can be used to drive effortless through town and country, but if you want you can go fast too. Very fast! The first three years the bike didn't change much. 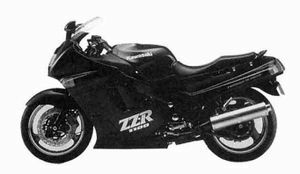 But in 1993 a completely renewed ZX-11 hit the streets redesignated as the ZX1100D. This page was last edited on 26 August 2010, at 18:37.